Medications used to treat toenail fungal infections are classified as an anti-fungal. These drugs are often taken by mouth, and have frequently been associated with a long list of risky side effects, as well as being rather pricey. While the majority of prescribed anti-fungal agents are oral medication, there are also a few topical fungicides that doctors use to treat an infection in the early stages. Oral or topical the normal length of treatment is 12 weeks for toenail fungus and 6 week for fingernail. Toenail fungal infections are very difficult to cure, and the process is usually long and pain staking. 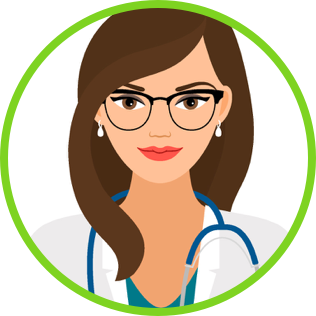 Before you can begin treatment, your doctor must figure out which type of fungus is causing the problem, from there your doctor will prescribe a medication to treat the fungus. This is where you need to be very careful; these drugs are very hard on the body and have a long list of side effects, as well as the potential for some very serious drug-drug interactions. You must be sure you tell your doctor about any and all medications you are on, over the counter and prescribed. 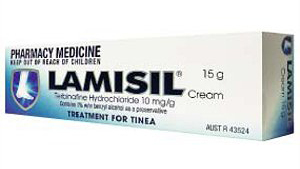 The most popular prescription medication for fungal infections is without a doubt Lamisil (terbinafine). This particular medicine is used only if the fungal infection is a dermatophytic infection. Lamisil is usually prescribed at 250 mg per day for 6-12 weeks, before you can start this drug therapy you must have blood levels draw and then monitored through out your course of treatment. These blood tests, and frequent doctors’ visits, along with the added cost of the drug are what make treating toenail fungal infections so very expensive. The above mentioned blood levels can not be avoided as doing so may result in liver damage. Because Lamisil is processed by the liver there are several rare hepatic side effects such as hepatitis, blood dyscrasias, as well as Stevens-Johnson syndrome. Complying with the doctor’s requests for random blood levels can prevent permanent damage. Another common drug available for toenail fungal infections is Diflucan (fluconazole). Diflucan is also a well known drug although it is used to treat fungal infections due to yeast. Both these drugs can be found in their generic form at a number of pharmacies nationwide for $4.00. 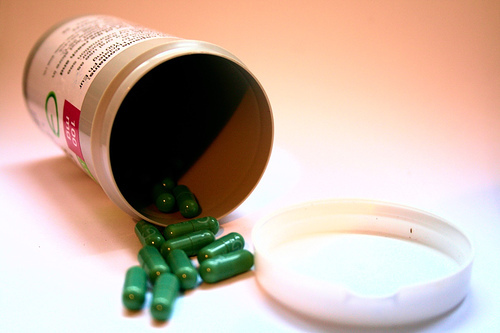 Many pharmacies such as Wal-mart, Target, and Publix offer drugs at a discounted rate. If you have to take these drugs for the extended amount of time it takes to treat a toenail fungus, it would definitely be worth your while to seek out these discounted markets. • griseofulvin is a very old drug and is rarely used anymore due to its lack of efficiency. • ketoconazole (Nizoral) is very effective however is not as widely used due to the high risks of hepatotoxicity. Choosing a drug that will work for you and your situation is ultimately up to you, and your doctor. Which ever medication you use, you must remember that the medicine is not enough on its own to cure your toenail fungus. You must stay on top of the situation and keep your feet clean and dry, if all goes well you will most definitely find yourself fungus free in 12 weeks! 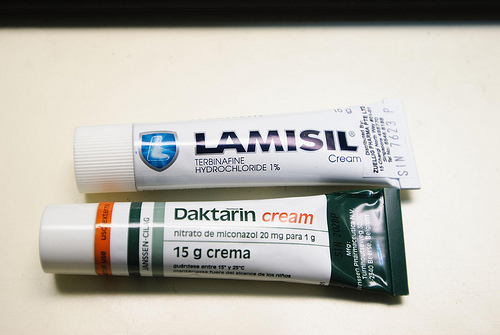 I have been using lamisil cream for a year and a half .I have a fungus in both my big toes ,just at the lateral side . My right toe is almost normal but my left toe persists. Is it dangerous to use this cream for such a long time? Got unsightly Nail Fungus ? Zetaclear – Unique topical and oral homeopathic combination can help you regain your hands and feet. In the past I have used Lamisil for toenail fungus. Unfortunately, it keeps coming back and it has affected four of my toenails on the left foot and three on the right. What is worst, my toenails are thick, but not brittle. I am hoping my doctor will again prescribe Lamisil if not another fungus treatment medication. But I am hoping to cure my toenails from this fungus. Years ago I was prescribed a course of Lamisil which took six months and did not work very well. Years later My doctor prescribed a course of tablets which were taken daily for a week thenevery third week. for three months. This worked realy well and because there was only a little tip of affected nail remaining, I thought I was cured so did not seek further treatment. I wish I had because that little bit of nail is stil affected no matter how many times I cut it out it still comes back. I think the tablets were Sporanox (but not sure). My doctor has since retired and his partner won’t prescribe anything. ( saving cash I suppose). Can sporanox be purchsed without prescription? Two months of treatment would see me cured as the remaining infection is minimal. I’ve had toenail fungus since 18 or so ( I’m 41 now ) and tried everything, pills, and topicals.Then I decided that maybe if I removed the nail the topical would work as it can now be applied to the fungus itself. The results were amazing although it took like 6 months I can wear sandals or go to a public pool and go barefoot! I have pics to prove it. email me @ roycoo@aol.com if youd like to see or if you’re interested in knowing what worked for me. This was an embarressing problem that I kept hidden from famiy, friends and others that I thought was gonna be with me for life but now it’s totally gone. Thank God!!! Please make sure that your doctor performs a blood test prior to prescribing any medication. my stepdad is currently in the hospital dying from drug induced liver failure. he was prescribed a medication for toenail fungus and because they failed to do blood work or a test of the liver his life is at stake. it’s pretty sad when it comes down to toe fungus or liver failure… so please just be aware I would love to see that prevented in the future. Wow! Stormi thank you for your post about the blood tests. I was just getting ready to pop a lamisal as I was reading your post. It is a prescription lI had left over from a few months ago. I had a blood test yesterday and was awaiting the results today, but figured what’s the harm to get started. Your story kept me from not waiting a few more hours. I hope your dad is much improved and I will certainly put him in my prayers. You’re right a fungus verses health..no comparison. I have toenail fungus (big toes). I have had a lot of antibiotics in my life and have had a candida problem and so believe toenail fungus is just part of the whole systemic thing of fungus. When your gut fora are messed about with antibiotics you will get total yeast overgrowth as all the good flora are knocked out with antibiotics. I have been using tea tree oil and it certainly is helping. The pharmaceutical antifungals are really dangerous and the fungus can mutate anyway and be resistant. If you don’t restrict your diet to an anti-candida diet – the problem will just come back because you are feeding the yeast. Its a case of healing from the inside, out. But trea tree oil helps on the way. I have taken oral medication prescribed by my doctor for the total period and notice that my toenail is growing in properly. However, that toe is very sore if I wear a covered toe shoe. Just wondering if this is a common side effect? I have had blood tests done and all is well.